As a satire about the absurdity of war and the way the news media covers it, Whiskey Tango Foxtrot has surprisingly dull fangs. Coming from Lorne Michaels and Tina Fey, this is especially surprising since neither is known for pulling punches. Nevertheless, this dramatic comedy is as close to cuddly as one could imagine from a story set in 2006-ish Afghanistan. Aside from the usual messages - war is hell, bad things happen to good people, and the American public has a short attention span for overseas conflicts - there’s nothing of substance to be found in Whiskey Tango Foxtrot. At times, it’s amusing but the jokes rarely provoke full-bellied laughter and the attempts at drama are uneven. At its best, this movie recalls Robert Altman’s MASH without equaling it but Whiskey Tango Foxtrot often isn’t close to that level. The film’s appeal, to the extent that it has appeal, comes mostly as a result of Tina Fey’s inherent likeability. As written, her character is underdeveloped but Fey brings a life and energy to the performance that elevates it above the lines found on the screenplay’s pages. Of Fey’s co-stars, only Martin Freeman has enough screen time to qualify as a solid supporting character. Margot Robbie is underused as a fellow female journalist. Alfred Molina, hidden under a bushy beard, comes across as a sit-com weasel whose comeuppance, although deserved, isn’t credible. The push-pull of comedy and drama in Whiskey Tango Foxtrot is uncertain. On more than one occasion, the movie can’t decide whether to go for the easy laugh or the jugular and many acceptable narrative shortcuts and cheats that might be acceptable in an overt satire feel artificial in a quasi-dramatic situation. Co-directors Glenn Ficarra and John Requa occasionally stumble when trying to weave a seamless tapestry that accommodates humor, tragedy, and moralizing. Although the movie is comprised of easily digestible morsels, none of the characters (with the possible exception of Fey’s Kim Baker) attains anything close to three-dimensionality. Whiskey Tango Foxtrot opens in 2003 after the war in Afghanistan has been “won.” With media attention now focusing on operations in Iraq, news stations scramble to find personnel to cover the tail of the earlier campaign. Baker, a TV news copy editor looking for a new career path, agrees to become one of the new faces in Afghanistan - a task that would be difficult enough if she also didn’t have to grapple with the rabid gender discrimination evident in the culture. It takes a while for her to get her feet under her but, after a period, she earns the admiration of her fellow journalists, including Brit Tanya Vanderpoel (Margot Robbie) and Scot Iain MacKelpie (Martin Freeman), as well as the respect of U.S. Marine General Hollanek (Billy Bob Thornton). But Baker is concerned about the decreasing support she’s getting from her network. In a face-to-face meeting with a programming executive, she’s told that viewers no longer care about Afghanistan and, unless she can deliver something attention-getting, things aren’t likely to change. The film’s goal isn’t that different from MASH, which used comedy to mask a serious message about the inhumanity and absurdity of war. Robert Altman’s scalpel, however, was considerably sharper than the one wielded by Ficarra and Requa, who soft-pedal their points to avoid challenging viewers. “Edgy” isn’t a word one would use to describe Whiskey Tango Foxtrot. The film’s secondary mission statement, exploring the “newsworthiness” of events (at least insofar as the public is concerned), is presented in a perfunctory fashion. The production isn’t saying anything new when it (correctly) observes how easily the American public loses interest in a story. Beyond a two-minute exchange between Baker and Cherry Jones’ executive, Whiskey Tango Foxtrot doesn’t do anything with this. The movie works so hard not to offend viewers that it ends up offering up a story with all the qualities (positive and negative) of a TV sitcom. I think the film wants to be thought-provoking but it’s hard to find anything here that’s new, controversial, or interesting. 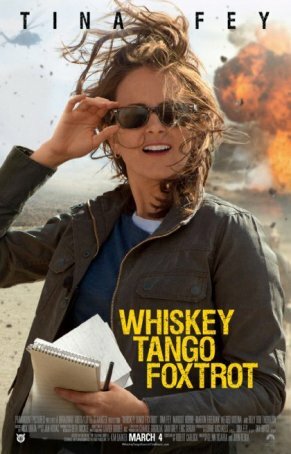 At best, Whiskey Tango Foxtrot can be seen as a mildly amusing fish-out-of-water tale about an untrained newswoman thrust into a dangerous situation. Tina Fey is the biggest asset but even she’s not sufficient to make it worth more than a marginal recommendation and a suggestion to wait until it shows up on home video.